Character, class, cooler heads, hope, ability, joy, hard work, cooperation, inclusion. I’m not feeling particularly eloquent tonight. That’s okay, I’ll let the President Elect be eloquent for me. In recent days, I’ve heard/seen Barack Obama described as cocky, arrogant, and elitist. (Yes, still with the elitist argument…puh-leez.) Anyone who watched this speech and still associates those adjectives with our President-to-be wasn’t listening and is simply trying to justify their dislike of him. Oh. My. Gosh…We did it. This is for us. For our children. For our parents. For our neighbors. For our brave soldiers, sailors, and flyers. For our relationship with the rest of the world. For our brothers and sisters who are without homes or without healthcare. I did not vote for a perfect man. 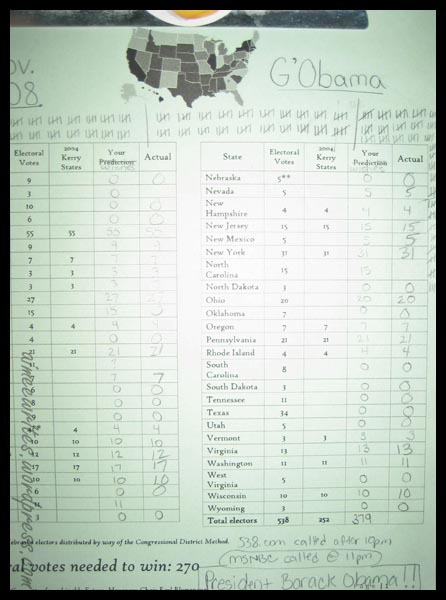 I did not vote for a man who can singlehandedly change the world. I voted for a man who believes in the ability of people working together to change the world. I voted for a man who doesn’t owe anything to anyone except his own conscience and the 300,000,000 people he represents to the world. I voted for a man who will do his best to fulfill the promise of health and safety for all people. I also voted for a man who is obviously in love with his wife and incredibly loving towards his children. Being married to such a man, I’ll admit, it warms my heart. I appreciated Senator McCain’s speech this evening. I have said for ages that I believe John McCain is a great man. I disagree with his proposed policies, and I would have been disappointed to see him elected President, but I admire him. I also believe his campaign was out of his control some time ago. He took some bad advice, handed over the reins, and lost control. You could see it in his eyes at rallies…he knew he was sinking. He was embarrassed by the misleading fear-mongering being propagated on behalf of his campaign. I believe President-Elect Obama knows the real John McCain, and I hope they will work together in the future. It’s a difficult week for us, on a personal level, but we are light-hearted. Yes, we have hope. Yes, we can. Yes, we did. The early voting lines were outrageous in a lot of places, including here in some of our Georgia counties. Isn’t it wonderful? No, although I lived in England for a bit, where queuing up is a national pastime, I haven’t adopted it as one of my favorite activities. Instead, I’m simply elated that people are so charged up by this election. They’re getting involved. Voting is important to them. I’ve said for years that voting in America is not only a right, but a responsibility. We are in a representative democracy. We elect the people who will shape our country, and if we don’t vote, how can we take any ownership or pride in it? 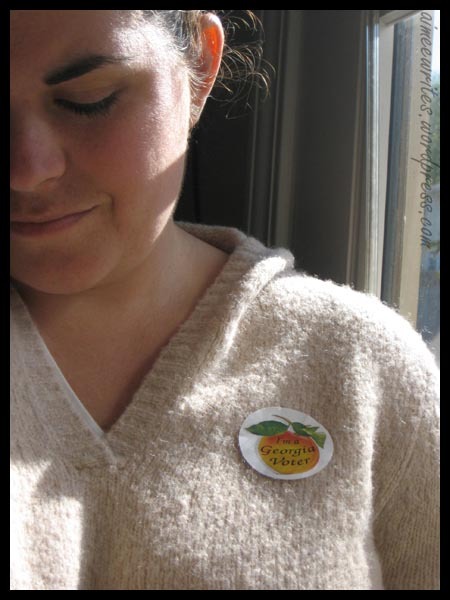 I stood next to a woman for three hours on Thursday while we waited to vote. I didn’t learn her name, but at one point, she shared with us that she had taken personal time off work to vote. Her employer had sent a company-wide email the previous day, stating that they did not pay their employees to stand in voting lines. The polls were open until 7:00, and they could all vote after work. Well, lines after working hours were well over 4 or 5 hours in our county (a poll worker told us that he had stayed ’til 10:30 two nights that week, and until after midnight one night), and who knows what it will be like on the fourth, so she took it upon herself to trade some of her precious personal hours to fulfill her right and responsibility as a citizen. That is how important this election is. My new friend, Tina, and I voted together today. I met Tina when we were parking our cars, about 1/4 mile from the early voting site. She was getting her portable chair out of the trunk, too, and we walked to the line together. We talked, we stood or sat together and read, she read while I crocheted. Three hours later, we left, knowing little more about each other than that she has a 22-year-old daughter and a mother who is a 16-month breast cancer survivor (Go, Tina’s mom!!) and I have 8- and 5-year-old sons and a mother who is a 25-year Hodgkin’s survivor (Go, Mom!). Neither of our mommies likes us to worry about them, but we do anyway. She works in a lab, and I am a stay-at-home mom. We both like to smile and joke. I stopped short of hugging her good-bye when we parted company at our cars (I know not everyone is a hugger like I am), but I sort of wish I hadn’t. I thought about getting a photo of the two of us together, but my camera was without its memory card. We avoided talking politics, beyond some generalities, and I wonder if today was a momentous one for her, as it was for me. So, Tina, whose last name I don’t know, who drives the SUV, thank you for sharing your morning with me. I’ll be thinking of you on Tuesday. I am making an effort to visualize Barack Obama as our president. I spend a moment or two each day thinking about the joy that will runneth over on the night of November 4, as it hits home. On November 5, when I am sure I will be walking on air. And on January 20, I see him taking the Oath of Office, Michelle at his side, their daughters close by, grinning from ear to ear. It will be cold that day, but thousands upon thousands will be there to witness this historic moment. Lastly, I envision eight years of positive change, with President Obama leading us step by step. Hard work and healthy results for our country, its people, and the world. I’ve been envisioning this for a few weeks now. I am choosing to focus on the positive, and when the negative intrudes, I give myself more time for positive visualization. Whether you call it the power of prayer, the law of attraction, or the power of positivity, this works. Envisioning the positive helps it become reality. 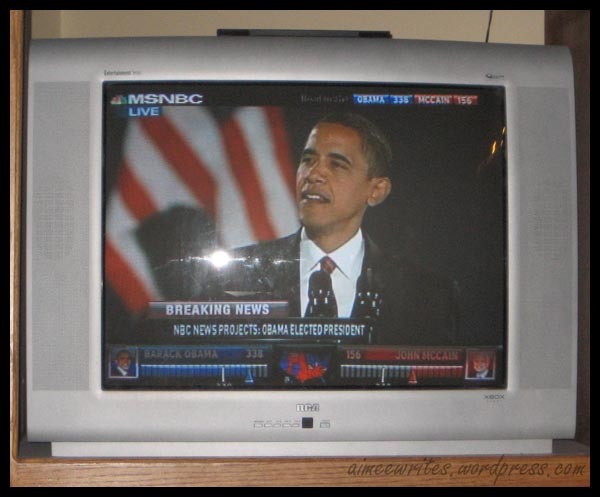 About two weeks ago, I got an idea for this site…which would help people visualize Obama being president. We felt that people seemed to be focusing on what they DIDN’T want, paying alot of attention to the other side’s “low-road” behavior & especially Palin’s shortcomings. And their poll numbers were going up, b/c so much (negative) attention was focused on them. We strongly believe that “what you focus on grows” – we’ve seen this over & over again in our lives & the world around us – and wanted to help ourselves & our friends change our focus to what we DO want. Which is peace, prosperity, leadership, hope & change – all possible if Obama wins on November 4th. It seemed very improbable 2 weeks ago that we could find time in our seriously overcommitted schedules to make any kind of viral video or website. Where would we get any compelling footage – wandering around downtown Asheville? Who would make the video – we don’t know anything about videography – and make it something worth watching? How would we find the time & resources to get this thing done? But we just had a sense that it was going to happen somehow, and decided not to focus on the questions, but instead to visualize it being complete. Things started “magically” falling into place – Jamie’s scheduled barbershop chorus competition last weekend got canceled, so I had time to work on it; Patrick Scully – Jamie’s dear buddy, boss & graphic design genius – had an unexplainable hole in his production schedule; he had just bought a digital video camera he lent us. Then Obama announced he would be preparing for the second debate IN ASHEVILLE of all places and would be speaking at a rally that weekend. Who were we to question at that point? We packed up the kids and got in line 5 and a half hours before the speech, with video camera in hand. The energy at the rally was unlike anything I’ve experienced. People smiling, making friends, comparing stories about why we’re so energized, and admitting we’ve never been so devoted to any political cause in our lives. The emotion was palpable. When Obama finally took the stage, with an estimated 28 thousand supporters packed in & around Asheville High football field, I don’t think there was a dry eye in the place. It was a day that all six of us will always remember. She goes on to talk about staying up most of the night editing, her husband building the website, etc. I don’t know them, but I’m so proud of them! This is the power of the people, brought to life. 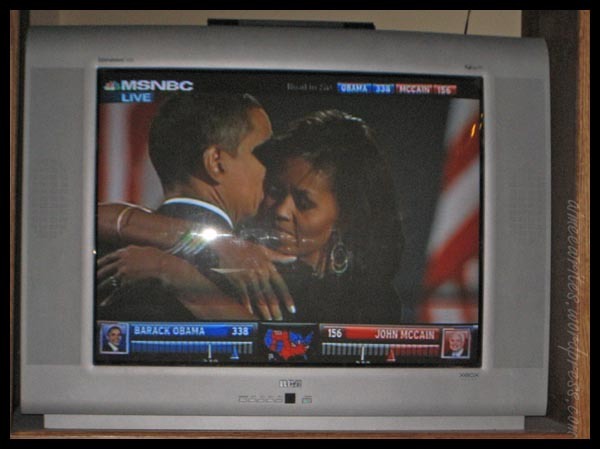 A very moving montage of Obama photos. I just made a quick run to the grocery store. 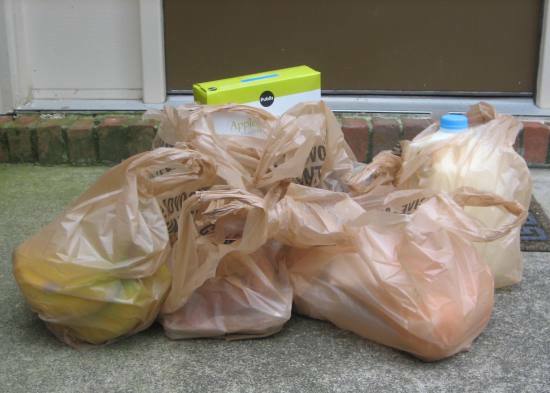 Mother Hubbard Cupboard Status has once again hit the kitchen, but today is payday, and I needed enough to get us through the next day or two, so I could sit down with menu planning and coupons and plan for the “real” grocery trip tomorrow or Friday. $47.60?!? Really???? Okay, let’s take out the ginormous container of coffee for $9.99 plus tax. (Even though that big thing gets me through a month or more and saves me a boatload of money in Dunkin’ Donuts & Starbucks drive-thrus.) So now it’s $37.50, give or take a few cents. The state of the economy, Sen. McCain, is not fundamentally strong when buying enough produce (not organic), meat (on sale), cereal (generic), and milk (also not organic) to last a family of four two days costs nearly forty dollars. Yes, I know about couponing. I know you can make a little money go a long way when you spend a few hours a week comparing sales and coupons. But that doesn’t cover produce, milk, and meat (usually), which are by far the most expensive parts of any grocery list. And what about those folks who are working their behinds off in one or two (or more) jobs and need that time at home to sleep or – Heaven forbid – spend time with their kids? Where are they going to find the time for the heavy couponing? 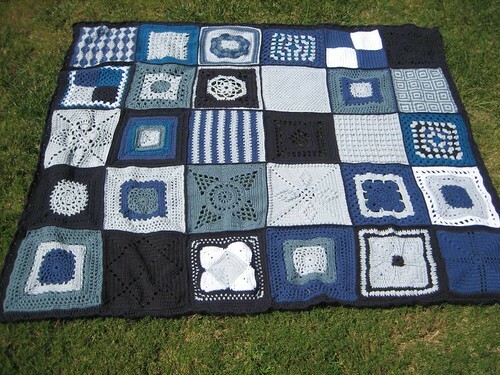 Remember my Crocheters for Obama quilt? It’s done! (Okay, I’ll admit, it’s been done nearly a month, and I simply haven’t gotten around to taking pictures.) I seamed all thirty squares together and added a border. It has been an honor to be trusted with this project. 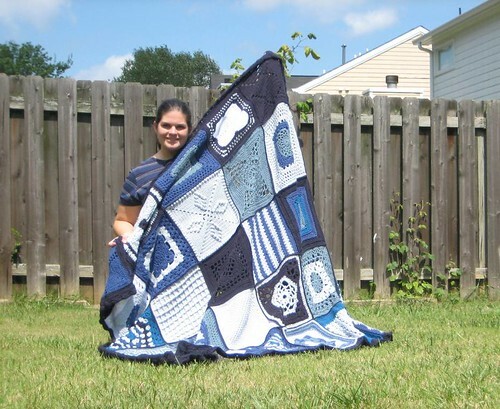 Here’s the quilt in its entirety…5’x6′ of beautiful blues! And, because I’m so proud (and because the blanket’s big enough to hide behind), here I am with it. Are you interested in winning this original piece of art? The deadline for the drawing has been extended through Labor Day! Click here for more information. I’ve been kicking this post around in my mind for a couple of weeks now, and the time has come to bite the bullet and just write the darn thing with the knowledge that I have an edit button and the ability to write further posts on the subject should I ever feel the need. There is a common misconception out there that left-wingers, liberals, progressives (pick your label) are not patriotic. That our protest of the war is automatically an abandonment of our fighting men and women. I find this attitude and accusation to be uninformed, egocentric, and downright insulting. I read an article a couple of years ago that clarified this distinction for me nicely. It came at a time when my patriotism – or that of people who think like me – was being questioned by people around me (although not my friends or family, thank goodness! ), the media, and prominent people in our government. At the time, I was angry and frustrated and insulted that anyone would accuse me of not supporting our troops or of not loving our country, and that article helped calm my nerves. What has swept over our country in recent years is not, as many would claim, a glorious wave of patriotism. Rather, it is a smothering flood of nationalism. A patriot will defend his country, whether on the battlefield or the sea or in the air, in the blogosphere, by working hard to keep drunk drivers off the roads and protect our loved ones, by running for office, or simply by being a representative citizen of his country in the best way he knows how. A patriot, in my mind, understands that no government is infallible and recognizes that it is our duty as citizens to question our government’s decisions and actions in order to keep the country moving in a positive direction. This kind of nationalism is dangerous. Just as believing your child could never do wrong and so turning a blind eye to his harmful actions is dangerous. Just as letting your child run about unfettered with no regard for the feelings of others is dangerous. Turning a blind eye to the poor decisions – and in many cases supporting those decisions – based solely on the fact that our government made them is so dangerous it’s staggering. This is very much a “my way or the highway” attitude that can have few positive effects in the world. Our country was founded on the principle that the people should decide its way. The people are supposed to be the guiding force behind the government. It’s a simple concept with a complex application (and that application could admittedly use a bit of work…but that’s a different post). So what does it say of our patriotism and our adherence to those original principles when we give up our own opinions to mutely follow in our government’s footsteps? It should be the other way around. I put it out there that ignoring these principles is decidedly unpatriotic. That giving free rein to our elected officials to decide our fate without question is a 180-degree turnaround from the base on which our country was founded. That we need to step back from the nationalistic crowing and think hard about what is really best for our country, our people, and the world around us. And if you are of the opinion that my protest of this war is somehow unpatriotic, or that somehow I don’t care about our troops, I put it to you that I see it as my duty as a patriot, and as a caring human being, to question any action that puts my beloved countrymen in harm’s way. There are times when war – as horrible as it is – is necessary. This was not one of them. This brings me to my current charity project. During the primary season, Knitters for Obama knit and crocheted somewhere around 1,000 hats and bibs for preemies in hospitals around the U.S. For the general election, we’ve changed our focus to taking care of people our government has abandoned. We are currently knitting and crocheting warm hats, scarves, fingerless gloves, lap blankets, and washcloths for homeless veterans in at least 4 states. How sad it is that there are so many veterans without family, without homes. These men (because they are all men in these particular shelters) sacrificed greatly for their country – our country – and receive next to nothing in the way of thanks or even basic needs from the government for whom they fought. One shelter has relayed to our group that the federal assistance they receive in a year wouldn’t pay for the needs of one veteran. I am one person with little energy. I cannot change the world. But I can give a few men who have served our country a warm head, a clean face, and a big thank you. And I can work to support a candidate who will fight for their rights. It is one small way I, a patriot, can do my part to contribute to our wonderful, full-of-potential country.